The park itself covers more than 8429 hectares (20,828 acres) of wilderness with a Provincial Campground on the west side of the lake. Schoen Lake is approximately 5 km long and similar to a banana shape. The lake is very deep with the maximum depth at the north end of the lake recorded at 252′. 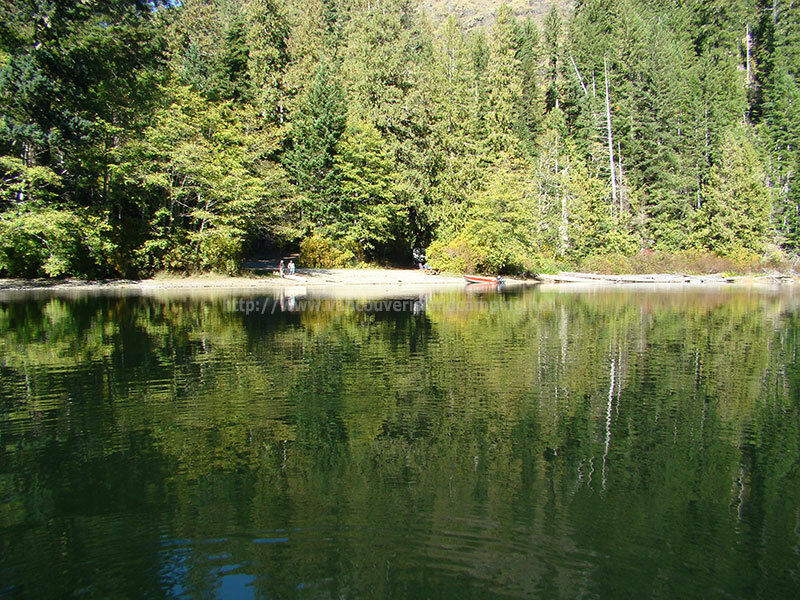 Schoen Lake Provincial Park was established in 1977 as a way to protect the old growth forests and Roosevelt Elk summer range. An addition (259 hectares) to the park was created in 1995 near the Davie River watershed where the campsite now resides. Mount Schoen is the peak that you see when you first step out on the beach at the natural gravel boat ramp between campsite numbers 5 and 6. The peak rises up 1862 (6109 ft) meters and lies roughly half way down the lake on the southeast side. In the past there has been snow still on the higher elevations of the mountain during the summer months, however in 2015 there was a drought of epic proportions for Vancouver Island and for the first time in a long time there was no snow on it. On the north east side of the lake is a trail named Nisnak and follows the creek up alongside of Mount Schoen to Nisnak Lake and further to the Upper Adam Road which winds through eastern part of the park parallel to the Adam River to provide access to the the local logging company which is logging just outside of the southeastern boundaries of Schoen Lake Provincial Park. Nisnak Lake Trail is unmaintained and will require some patience when trying to hike it due to the lack of ribbons or markers identifying the trail. 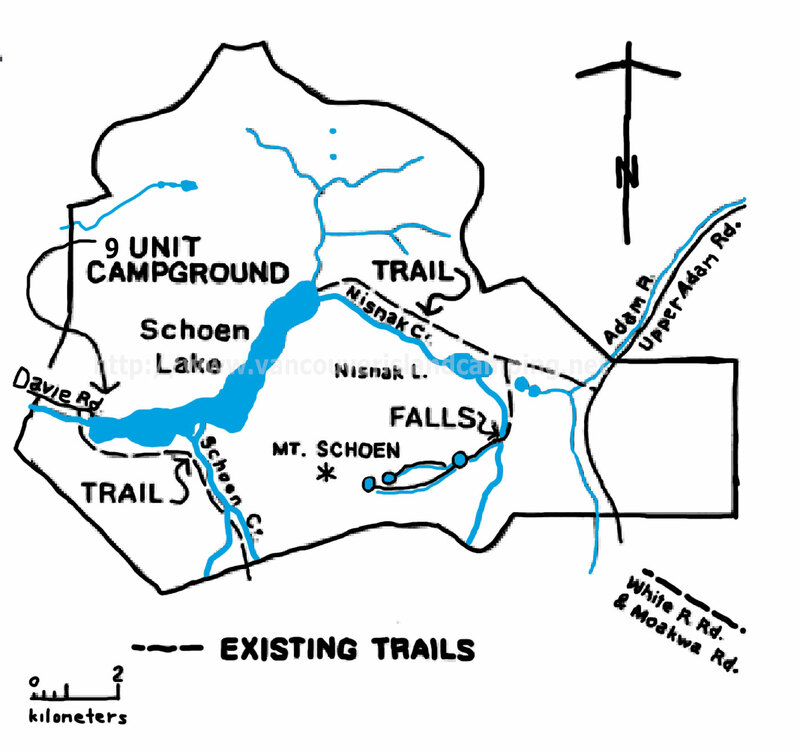 The trail winds along the Nisnak Creek through old growth forest at the base of Mount Schoen until it arrives at the lake and then continues on to the falls and upper small lakes on Mount Schoen. 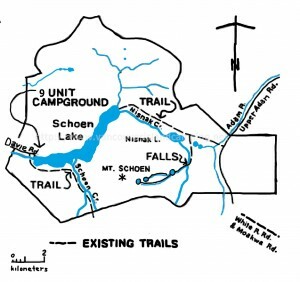 It is unfortunate that BC Parks has never followed up on the Schoen Lake Provincial Park Master Plan and maintained the trails or provided another campground on the south side beside Schoen Creek. These plans could have been implemented and still kept the park in pristine condition and maintain the integrity of the ecology and wilderness experience if done correctly. Be curious to know where all the money collected from the existing campground has been spent as it doesn’t look like any has been spent on the area in quite some time. Nevertheless the park provides a wilderness experience that most won’t get to see in their lifetime if they don’t get out into the great outdoors much. I highly recommend a visit to this superb provincial park campsite if you can find the time as you won’t be disappointed. While I was at Schoen Lake campgrounds I didn’t see any wildlife up close other than a Kingfisher, a couple of Loons and some Mergansers fishing for meals. I did however see sign of elk and bear and heard an owl once or twice. The information kiosk states that there are bears, cougars and wolves that prey on the local Blacktail Deer and Roosevelt Elk population so keep your wits about you. Especially if heading for the other end of the lake to hike the Nisnak Creek Trail. I also noticed a couple of hawks but they were too far away to identify but looked like Red Tails. Ravens also flew around the area now and then but not in the numbers I’ve noticed at other Vancouver Island lakes. There were a few ducks swimming around the edge of the lake but again I couldn’t get close enough with my float tube to see what they were. To get there, find your way to Vancouver Island, British Columbia, Canada and drive up the island highway to the city of Campbell River. From there follow the signs to the village of Sayward. Stay on the highway (hwy 19) and follow the signs to Woss and Port Hardy. About 40 minutes past Sayward you will see a sign that says Mt Cain and it is there that you will turn left off of the highway onto Nimpkish Rd. Use the form below to find out how to get to Schoen Lake Campground using Google Maps. About 500 yards in there will be a junction in the road that has signs for Mt Cain/Schoen Lake and the road will split. One direction takes you across the Davie River bridge towards Klaklakama and Vernon Lakes and the other route will take you to Schoen Lake. Take the gravel road to your left that heads towards Mt Cain and Schoen Lake. Stay to your right until you arrive at the Schoen Lake Provincial Park sign and you are only a few minutes from the campground. Take your time as the road is poorly maintained and narrow. Once you arrive at the campgrounds you will see two pit toilets on your right and a little further along is the information kiosk where you will find the firewood shed and maps for the area. There is also a metal box for your overnight fees to be place inside an envelope (you provide) and insert into the box. Make sure you provide the number of your campsite and the date for the night you are paying for. The camp host is present from May 15 to September 15 of every year in campsite number four where you can pay for your overnight stays also. The fees for staying in the campgrounds are $11.00 including taxes for the night and seniors are half rate except from June 16 to September 05, 2016 or the first Monday in September of every year. Camping is free from September 15 until November 1 then they close the gate due to extreme winter hazards and open the gate again on April 1st when camping is free until May 15. The camp host tells me that even during the heavy summer months they won’t turn anyone away but you may have to be placed alongside the road until a space opens up. The maximum amount of time that a camping party can stay is 14 days after which you must leave and make room for someone else. A camping party is defined as 1-4 persons 16 years of age or older. There is a maximum of 8 persons including children 15 years old and younger. The standard rule is for one vehicle and trailer only per site unless you get authorization for a second (non rv) vehicle at a charge of 1/2 the normal nightly rate on top of your other vehicle nightly rate. A towed vehicle behind your original vehicle is not considered a second vehicle for the purpose of the rate. 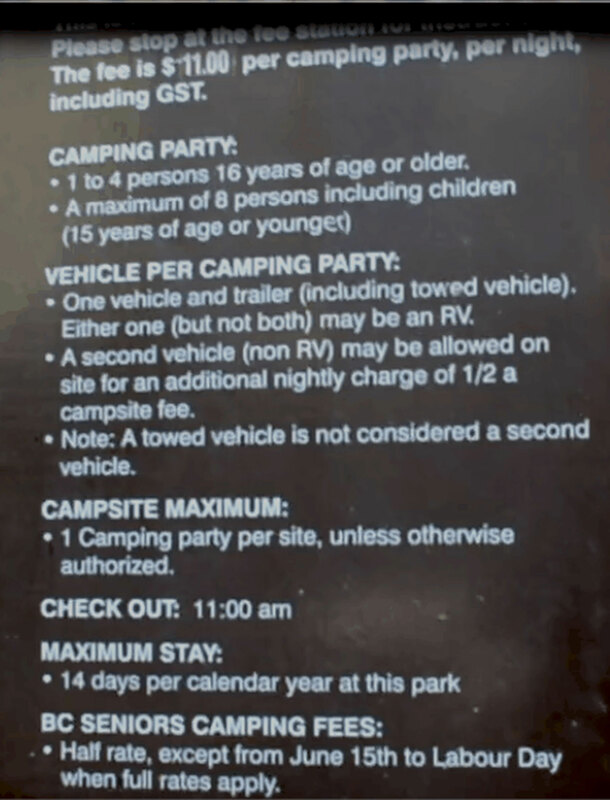 In other words, if you arrive in a RV with a Jeep or Suzuki being towed behind it you will only be charged for one vehicle per night. Fishing Schoen Lake is very productive and most anglers will troll using willow leafs or spoons. While I was there I caught and released a couple of nice Trout from my float tube using a fly rod and dry flies. I also noticed a couple of salmon jumping around the log jam at Davie River so I have to assume that there is the possibility of Steelhead also being present in the system. While I was there the wind picked up every day except for one around noon and lasted until roughly 4:00 pm. Shouldn’t affect anyone with a motorized boat however. There was a couple from Nanaimo with a 16 foot boat that also did very well fishing using spoons. Lawrence and Kay were their names and at one point Lawrence took me for a boat ride to the other end of the lake to take some photos and do a little fishing. A very nice couple who were heading to Vernon Lake the same day I left for home. This is a relatively small lake in the big scheme of things when it comes to allowing motorized boats so if your two stroke boat motor uses a lot of oil and spews it through the exhaust back into the lake then please be responsible and try to not spend too much time on the water. Every little bit helps and this is definitely a place to be kept in prime condition for future adventurers. If you are looking for a great place to go camping on your next vacation then Schoen Lake Provincial Park is an excellent choice. With a small but efficient campground and hiking trails the area provides an opportunity to experience the wilderness in all its remote glory. Remember that bears, cougars and wolves prey in the area and always be aware and careful when hiking. If you can take a boat ride to the other end of the lake you won’t be disappointed. The meadows and old growth forests are well worth the visit especially for photo opportunities. Always be responsible and never leave garbage behind or disturb the environment. Practice good camping etiquette and this beautiful serene wilderness retreat will be around for everyone who comes after you and beyond. I find it incredible that gas powered boats are allowed on the lake. In that wilderness area, we should do everything we can to eliminate the introduction of pollutants. Lots of lakes on Vancouver Island forbid fuel powered boats. Schoen should be similarly protected. Hi Vaughn, thanks for your comment and you are not alone in your view about gas powered boats being allowed on Schoen Lake. In fact, it was requested by a few organizations when the call for input was put out back when the management plan was created. The only saving grace these days (if there is one) is that most gas powered outboards are 4 stroke so the pollution is minimized a lot compared to 2 stroke engines. Glad I found this website as it brings back memories of the old days when I used to visit a lot of these campsites regularly. Schoen Lake is one of the most beautiful lakes (in my opinion) on the island especially in the late spring when the snow still resides on the mountain peaks which seem to be right in front of you as you gaze across the water. I’ve been on the trail at the top end of the lake and at one time it was in good shape and a very hike for the adventurous. Standing on top of the peak affords you one of the best scenic views of the whole lake and valleys that surround the watershed. I definitely recommend this campground for the remoteness of the area and also good fishing. Thanks again for your comments Lloyd. This also is one of my favorites (so far) that I have camped at. I actually went to the trail at the top end of the lake but could not find the actual trail head so I decided not to waste time and head back to the campground. 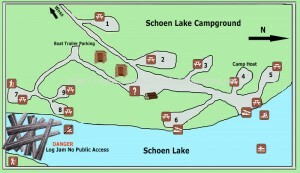 Given there are only nine campsites, what do you do if you get to Schoen Lake and it’s full up? Where’s the next closest place to go? Our plan is to arrive mid-week and hope that the weekend campers have cleared out. Hi Dan, thanks for your question. The camp host is pretty good at Schoen Lake campground for finding you a temporary spot until a regular campsite opens up. Leaving mid week is a good plan to allow for the long weekend campers to leave and open some spots. The next closest place to go is Klaklakama Lake which has two campsites on it. Klaklakama is only 5 minutes away from Schoen Lake turn off. 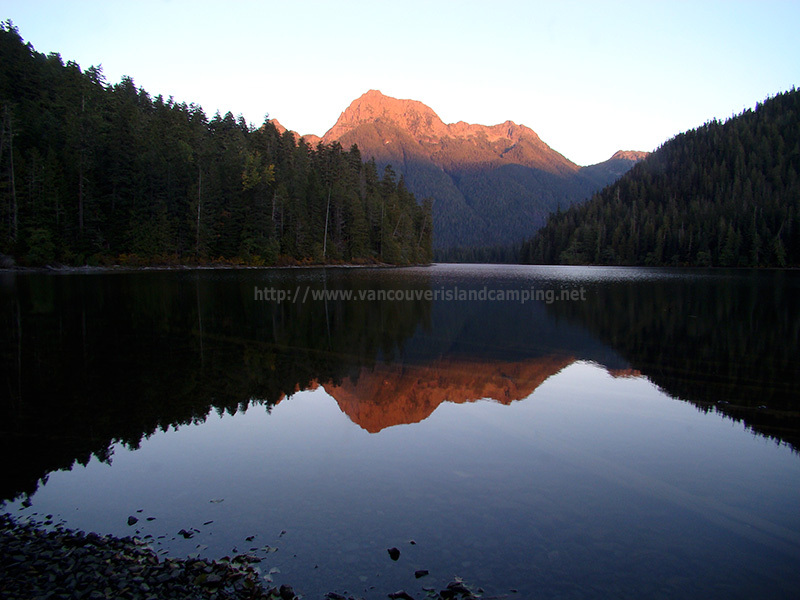 Vernon Lake campgrounds are only 15-25 minutes away and Woss Lake campgrounds are only 20 minutes away. Is the road to Schoen Lake paved? 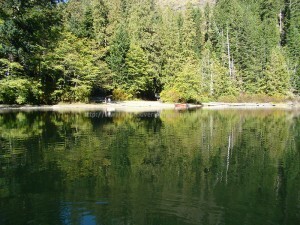 Hi Renee, thanks for your inquiry to Vancouver Island Camping. The road to the Nimpkish Main Road from Campbell River is paved but the roughly 12 km to Schoen Lake Campground is gravel. When I visited a couple of years ago the road was in pretty good shape just a little narrow in spots but still passable by a large motorhome which was there when I arrived. As with every gravel road just take your time and let others pass when you can and you’ll do fine. Hope this helps. Your very welcome, hope you have a great time. Hi Judy, thanks for visiting vancouverislandcamping.net and your question. There is a loop that goes past the pit toilets and hooks back onto the main road from the trailer parking overflow where you should be able to turn around. Depending on what time of the year you're going to Schoen Lake there are some good long campsite entrances (see the campsite map in the article) which will allow for a longer travel trailer to back into. The camp host will help you with turning around and finding you a place to back into if one is available. If you arrive later in the year and the camp host isn't around, than just park by the pit toilets and walk down to the lake to look for an appropriate campsite so you don't have to back up to the turn around if all is full. Hope this helps and have fun! Do we need to have a BC Parks pass to stay here? It looks beautiful there. Excited to see it in person. Hi Kelly, thanks for your question. No you don’t need a park permit to camp at Schoen Lake Campground. 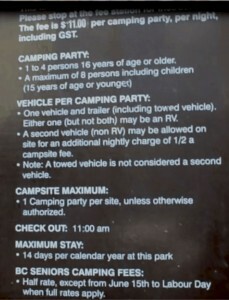 You will be required to pay a camping fee however. It is a very beautiful place and one of my favourites. Please check back in after your visit and let us know how it went we’d love to hear about your trip and any pertinent information about the park and campgrounds. Do you know whether the Nisnak Creek Trail can be accessed from the east side I.e. from the Adam River Rd? My son and made an attempt at kiwi falls last September. We decided to go in blind with no research to test our exploration wits! Had a blast but not knowing the trails are unmaintained only managed to stumble across the lower falls not knowing what we were actually looking for.. we had to turn back as the day was getting short and didn’t have a trail to follow out. We went through the Adam main side and plan to soon go back and get to the kiwi falls with the info required this time! Really want to hike the Meadows in bloom! Do you know best time to do this? Hi Jes, I’ve heard the trails aren’t maintained so you may want to post on the BC Parks website asking for more information also. I believe to access the meadows in bloom would be in early July or even Aug depending on the snow pack that winter. I am not 100% sure on this prediction but most of the alpine meadows bloom around this time based on my experiences. Hope this helps.